Here at Roofing Superstore we are proud to offer a wide range of genuine VELUX blinds, all at our famously competitive prices. From roller blinds and venetian blinds, to blinds with various Disney and Star Wars designs on, you can be confident in their quality and longevity. 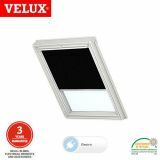 This range includes the ever popular VELUX blackout blinds, including the more traditional blackout blinds, the Duo blackout blinds, and the energy blackout blinds. What are the differences between blackout blinds, duo blackout blinds, and energy blackout blinds? VELUX blackout blinds are the perfect way to sleep soundly at any time of day. With 100% coverage, easy installation and operation, these blinds are ideal for bedrooms that benefit from lots of natural light. 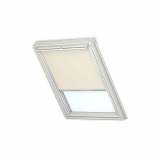 VELUX blackout blinds are constructed from special three-layered Oeko-Tex® fabric. This fabric is hard wearing, dirt repellent and is able to block out all daylight in any room. Traditionally, blackout blinds would have a halo of light around each edge allowing just enough light through to disturb restful sleep. 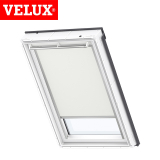 VELUX blackout blinds use an innovative side channel construction to ensure no light leaks through the sides. 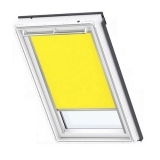 The side channels are an aluminium frame that surrounds the blind and fastens to the window frame. 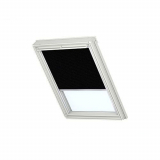 This system ensures no light shines through at all. VELUX blackout blinds lend themselves well to children’s bedrooms to help encourage daytime naps, bedrooms of all kinds of shift workers, light sleepers or anyone who benefits from dark surroundings when resting. 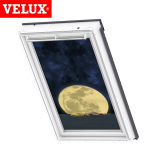 Available in multiple colours, 22 child-friendly designs and in multiple opacities, there is a VELUX blackout blind for every room. Your new blind can be manually operated, electric or solar-powered too! 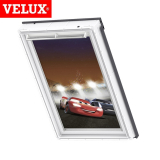 VELUX don’t just make blinds, they manufacture entire window systems too. 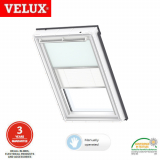 Check out our range of VELUX windows. 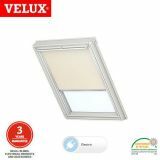 VELUX duo blackout blinds consist of two blinds within one system. A duo blackout blind consists of a blackout blind made from the OEKO-TEX dirt resistant and durable material, which has an aluminium coating on the back to reduce heat loss in the summer and over heating in the summer. The second part of the duo blackout blind is the pleated blind, which helps to diffuse daylight whilst still allowing some light in. The benefit of the Duo blackout blind is that it can be used to completely block out the sunlight when required for daytime naps, or sleeping in the summer, but it can also be used to simply reduce the glare of the sun whilst still allowing natural light to brighten the room. Energy saving blackout blinds have been manufactured to provide a level of insulation, as well as completely blocking out the light when required. Energy saving blinds consist of a double pleated blackout material over an aluminium honeycomb structure. The blackout material prevents the light from entering the room, whilst the aluminium honeycomb structure traps air, creating a layer of insulation which prevents heat from leaving the room, reducing the amount of energy required to keep the room warm. 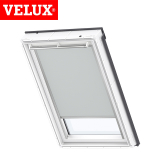 Why choose a VELUX blind? 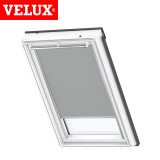 VELUX blinds have been manufactured to fit each VELUX window perfectly. 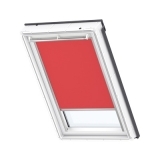 Simply find the code of your VELUX window on the data plate, and use this code to find the corresponding blind. VELUX blinds are incredibly easy to install. 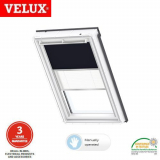 VELUX have created a Pick & Click system, which means there are pre-installed mounting brackets on each VELUX window, ready for the installation of any VELUX blind. 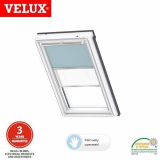 The VELUX blind simply clicks into place, and each blind is supplied with detailed installation instructions if required. 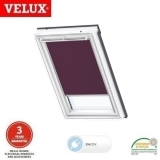 VELUX blinds come in a range of different colours to choose from, but they can also be operated in a number of different ways. 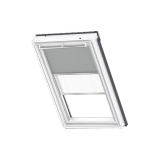 Manually operated blinds are super simple and easy to use, perfect for those VELUX windows that are in arms reach. Simply pull the control handle down or up, and the blind will adjust as desired. If your roof windows are in hard to reach places, or you’re looking for that extra level of comfort and ease, there are a couple of other options. Firstly, electric blinds are most commonly used in conjunction with VELUX INTEGRA electric windows. The blinds are remote controlled, and can be paired with your INTEGRA system that operates the electric windows to easily control your blinds. Additionally, multiple blinds can be programmed to be simultaneously operated with a single switch. 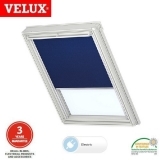 The other option when looking for a remotely controlled blind is to choose a solar powered VELUX blind. 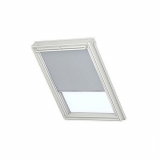 These blinds are operated with a wall switch, similarly to electric blinds. The solar powered battery can provide enough energy for 600 operations, and that is without direct sunlight for charging. 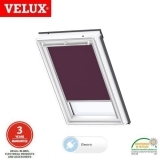 Electric and solar powered blinds can also be used on manually operated VELUX windows, all that is required is to purchase a conversion kit alongside the blind. If you have any questions or queries about VELUX blackout blinds, call our team on 01752 692760 or use the live chat and they will be more than happy to help.